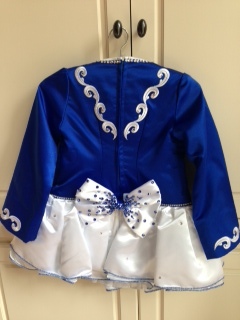 Twinkle blue satin dress with white satin skirt custom-made for dancer with sensitive skin. Embroidery with crystals on the front and back and on the white satin skirt. 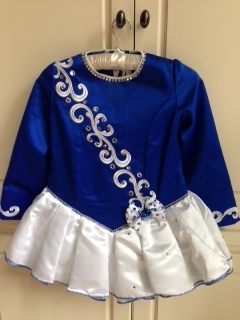 This extremely light weight dress receives numerous compliments on stage. Dress is fully lined and unzips all the way from top to bottom. 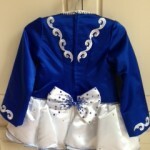 Includes bloomers and bow for hair. From smoke-free, and animal free home. No odors and no stains. There is minimal let out room. All sales final but is negotiable depending on circumstance. Asking Price: $US800.00. Shipping costs are: Are included for my own country, overseas shipping is extra. Sale is final.